Striker Diego Costa will miss Chelsea's next three domestic matches after a Football Association charge of violent conduct was upheld. Costa denied the charge, relating to an incident involving Laurent Koscielny during Saturday's 2-0 win over Arsenal. Costa, 26, put his hands in Koscielny's face before clashing with Gabriel, who was sent off but had a three-game ban overturned earlier on Tuesday. In a statement, Chelsea said they were "disappointed" with the verdict. Costa's ban covers Chelsea's League Cup match at Walsall on Wednesday along with Premier League matches against Newcastle and Southampton. Having confirmed the match officials did not see the incident between Costa and Koscielny, the FA supplied video footage to a panel of three former elite referees. Each had to independently rule Costa's actions to be an instant red card for the FA to proceed with the charge. 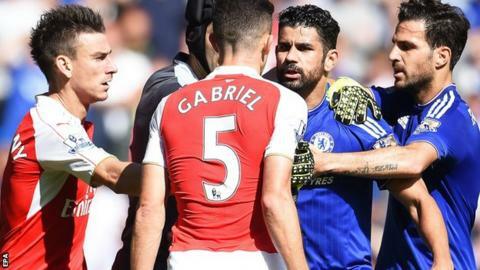 Arsenal defender Gabriel was sent off by referee Mike Dean for violent conduct after raising his leg and appearing to catch Spain international Costa. Stoke manager Mark Hughes, who saw winger Ibrahim Afellay's ban for slapping West Brom's Craig Gardner in August reduced from three games to two, said he is left "scratching his head" by the FA's decision to overturn Gabriel's ban. "I'm not sure why Afellay had a two-game ban when I see news of other situations which seemed to be deemed violent conduct and they get wiped off," Hughes told BBC Radio 5 live. "We keep asking for explanations from the FA about why they come to decisions against us - or we're getting different ones to other clubs. This is a prime example of that. We're bemused by it." The FA has charged Gabriel with improper conduct for failing to leave the pitch immediately after being sent off, and both clubs with failing to control their players. All three parties have until 18:00 BST on Thursday to reply to those charges.